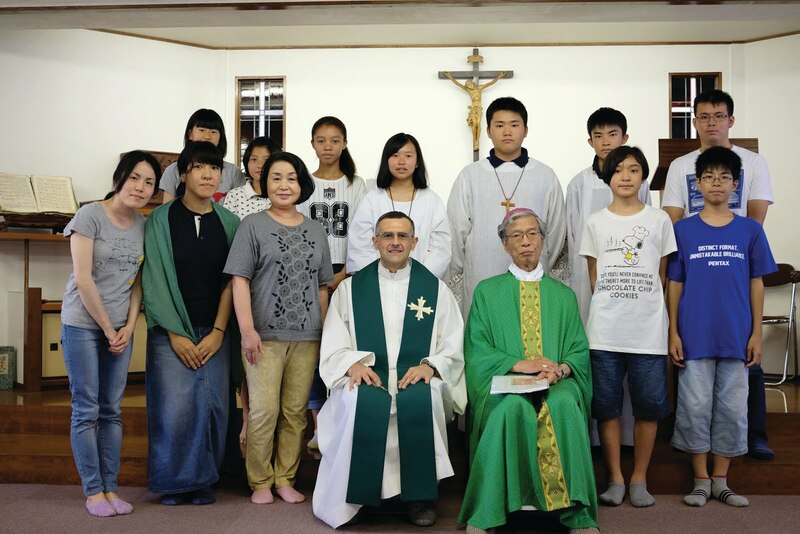 On September 19, 2016 a solemn Holy Mass was celebrated in the Tokyo Cathedral to mark the canonization of St. Teresa of Calcutta that took place in Rome a few days earlier (September 4). Archbishop Pedro Okada Takeo presided over the Eucharistic Celebration concelebrated by about thirty priests and with some Sisters of Charity and a large throng of laypeople that filled the cathedral and created a prayerful environment. Our PIME Institute was represented by Fr. Sudhakar and me. Outside, persistent rain failed to dampen the spirit of the faithful who gathered in great number around the altar and the Archbishop to thank God for the gift to the Church and to the world of St. Teresa of Calcutta as a giant of genuine charity and model of compassion for humanity’s many forms of poverty. My voice joined all others in this celebration of thankfulness and praise. But the celebration helped me recall my priestly work with the Sisters of Mother Teresa in Italy and Japan and the influence that this Saint has had and, of course, continues to have on my life as a believer and as a missionary. In a way, Mother Teresa was with me already in the relatively distant 1997. The fall of that year I was giving serious consideration to the possibility of exploring the contemplative life by visiting the Abbey of Chiaravalle della Colomba. In that grace-filled silence I wanted to discern the depth of my desire to embrace the contemplative life. On a Sunday afternoon, my eyes landed on a bookshelf in the guesthouse. Glancing leisurely one book after another, I was intrigued by the title of a small book: “At The End of Our Life We Will Be Judged on Love.” It was a collection of sayings by Mother Teresa. I picked it up and, totally enthralled by the depth and simplicity of its content, I did not put it down until I was done reading it from cover to cover. The gift of tears that I experienced in the wake of reading that booklet caught me by surprise and, with it, also the desire to imitate Mother Teresa as well in the mission of announcing Christ’s love to the ends of the earth. Soon after that first spiritual epiphany, I tried to join the prayer life and the apostolate of the Missionary Sisters of Charity. With intense joy I learned that they had a house and a hospitality center in Corsico, the town of my parents, on the outskirts of Milan. At that time, my work also included trips to the southern part of Italy and, in my desire to work with the Sisters of Charity among the most destitute, I also found that they had a house in Naples. In the Lenten season of 1998, I met with some Missionary Fathers of Charity (the male branch of Mother Teresa’s religious family, which also includes a Lay Brothers branch.) Attracted by their lifestyle and apostolate, I asked if I could have a little experience in their house in Via di Tor Fiscale, Rome. I took a week off from work during Holy Week for this “come and see”, as they call these experiences. I had an extraordinary experience of prayer and apostolate touching somewhat firsthand the miserable situation of the Italian capital of the time. But something told me that I had not yet arrived at the end of my spiritual quest; hence, I resumed my daily life trusting that the Lord would once more show me the path I should take. Entering into contact with the Sisters of Mother Teresa brought me generous gifts including that of many friends within the circle of volunteers and collaborators in the apostolate, both in Milan and in other parts of Italy. 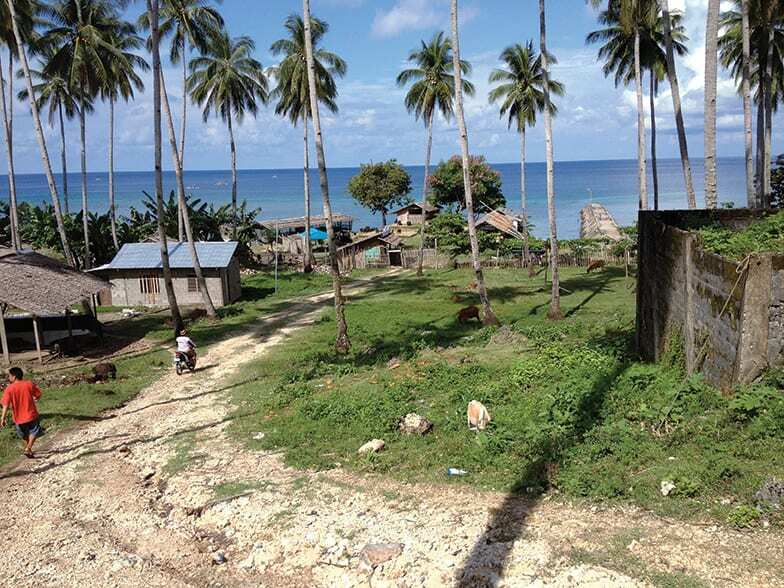 I befriended quite a few also among the Lay Missionaries of Charity, an international movement of lay consecrated to God who make private vows of conjugal chastity and also of poverty, obedience and a fourth one of total, free service to the poorest of the poor. Some of the poorest might be found within their own family members. Their spirituality is inspired by the Holy Family of Nazareth. I owe it to a member of this lay movement, a lady by the name of Magda, through whom a little later in May of 1998 I got to know Fr. Adriano Cadei of PIME in Milan. 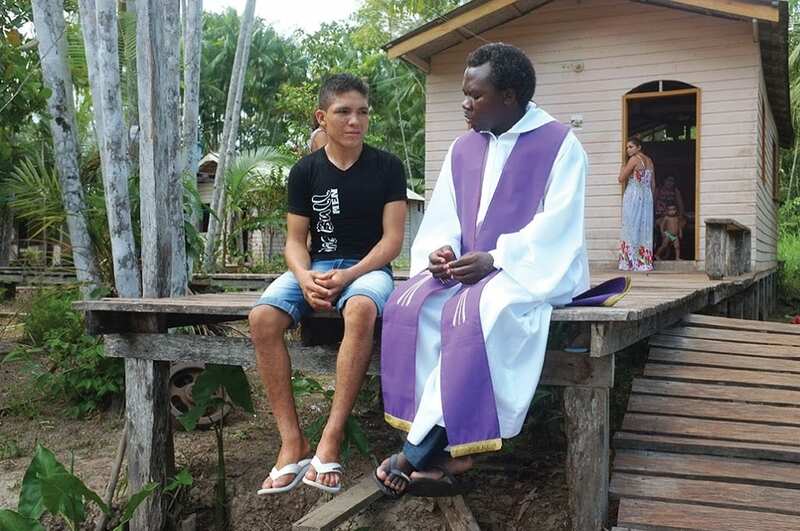 On her advice, in response to my desire to know the PIME missionary institute and its Charism, I contacted a youth missionary group at the Milan Mission Center. Thus, my journey of vocational discernment began with this group that gathered monthly at the PIME Villa Grugana (Lecco ) Retreat Center. The beautiful outcome of this journey was leaving my former secular lifestyle to enter the PIME seminary in Rome. This happened on October 4, 1999, the feast of St. Francis of Assisi, just before the opening of the Great Jubilee of 2000. But before I could realize my dream of becoming a missionary, I had to face years of rigorous preparation with an occasional healthy sweat?. I did three years in Rome taking philosophy courses followed by a year of spirituality. After that I spent a year in Detroit to learn English and five years in the Philippines (Tagaytay) for theology courses. 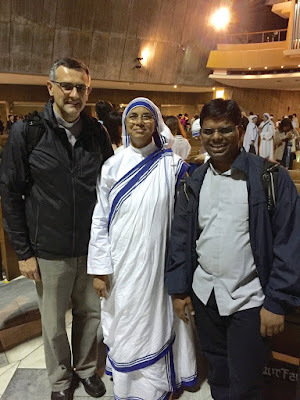 During these years I was able to visit several houses of the Sisters of Mother Teresa, and to preserve and to practice my previous experience of prayer and apostolate with them. 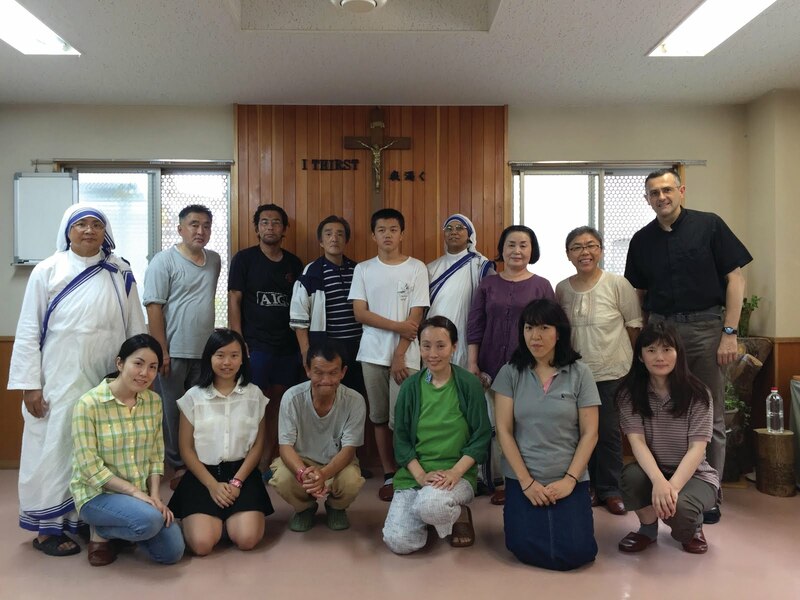 Just over three years ago, thanks to Father Marco Villa, I got in touch with the Sisters of Mother Teresa in Nishiarai (Tokyo) and since then I am often invited to their celebrations on various occasions and to preach their monthly retreats. During my pastoral work in the Church of Soka (Saitama) twice I have taken Confirmation candidates (2014 and 2016) to the nuns’ community to experience their spirituality and apostolate with the elderly. I conclude by borrowing the words full of affection and gratitude for Mother Teresa that the Holy Father Francis expressed in his homily at the Holy Mass of Canonization on Sunday, September 4. That day also marked 2016 as the Jubilee of the operators and volunteers of Mercy. “Today I present this emblematic figure of woman and religious to you and to the whole world of volunteerism: may she be your model of holiness! Perhaps, I think that we’ll have a little difficulty in calling her ‘Saint Teresa:’ her holiness is so close to us, so tender and fruitful that we will continue to spontaneously call her ‘Mother Teresa’”.